To a pet that needs your help. They will show their appreciation for the rest of their lives and you will gain a friend that you’ll never forget! Pet Adoption Alternative of Warren (PAAWarren) is an independent, non-profit 501(C)(3), completely volunteer-run, foster-based animal rescue organization. These animals can’t make it without our help and we can’t do it without yours. Get Involved! Follow us on Social Media, share our posts of adoptable pets, volunteer, foster and please donate. Click here for other ways you can help. Reduced Adoption Fee of $75. Please consider adopting an FIV Kitty! FIV cats can live 15 years or more with FIV and can even live with non-FIV cats. Meet sweetheart Daisy Sweets! She is very outgoing, friendly and loves to have your attention! This pretty girl has already had a litter of kittens and fulfilled her "momma" duties and is ready for a great home. Daisy is very sleek and slender and is listed as "special needs" because she did test positive for FIV. Please do not let that hinder your ability to love her and own her as a pet! 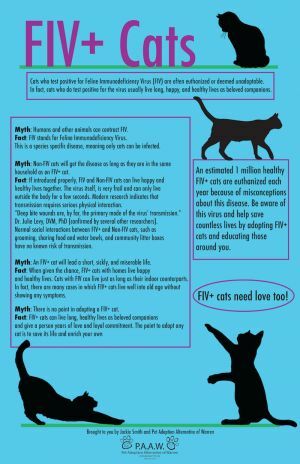 FIV+ cats are no different from other kitties except for their immunodeficiency. Often they show no signs at all. Daisy is thriving in foster care and is happy, loving and very sweet. She would make a wonderful companion! Please consider giving her a forever home. Estimated Birthday 2014 If you would like to set up a meet and greet, please complete our online adoption application form on our website: www.paawarren.org. She is not currently staying at the Meowtown/Pet Valu West Bloomfield location, however her foster mom is available most nights and weekends to meet in this location for a meet and greet. Adoption fee includes feluk/fiv combo test, current vaccines, spay/neuter, and microchip! Special adoption fee is $75.